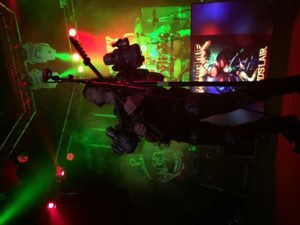 Powerglove: A band from Boston that does an amazing, glorious thing. 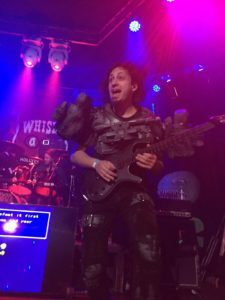 They play speed-metal covers of video game and cartoon music. These guys have been around forever. 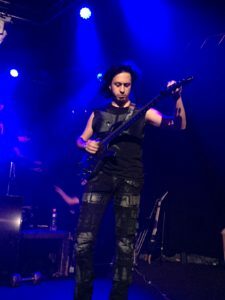 I remember hearing about them back around 2008-2009, just about the same time as DragonForce was getting big. In fact, the bands even toured together. I’ve loved them ever since. And when they announced they were touring for their new album ‘Continue?’, there was no way I could miss that show. I was hugely surprised when I saw that the band’s enormous sound came out of three guys. One on drums, one on guitar, and one on guitar/keyboards (often at the exact same time, which was mind blowing and impressive. 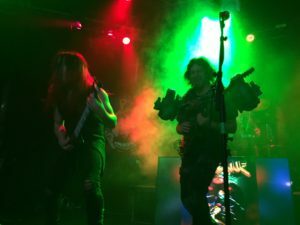 In addition to playing songs that were familiar to any video game fan, like the Tetris theme, Guile’s theme from Street Fighter 2, or the Metroid Dungeon music, these guys legitimately put on a SHOW. 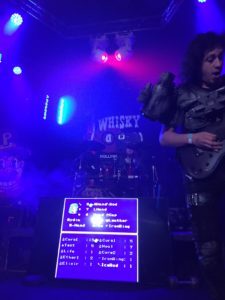 Powerglove had a flatscreen TV behind them on stage, where an animated version of Zebediah Pong from the strange NES game Totally Rad announced each song coming up and what year we were taking ourselves back to. The show had an excitement to it, like you hoped to recognize the next song they were going to play. That sort of tingling anticipation you get as a kid when you’re going on a new roller coaster for the first time in the dark. You know it’s going to be magic. 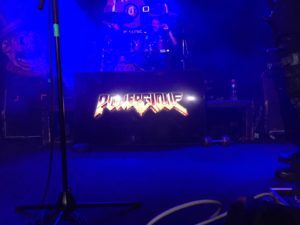 PowerGlove is a long time favorite of mine, and I was so stoked to be able to see them perform. 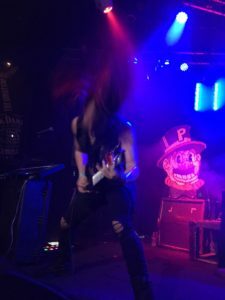 Smashed up against the stage, because that’s how I do it at the Whisky A Go-Go in Hollywood, California. I worm my way to the front and make sure not to move. 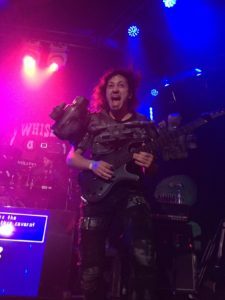 Thrash out with Loryn on Twitter.